In breaking news, newly-leaked information has come to us concerning the protests that are being planned following the verdict of Darren Wilson in Ferguson, Missouri. The verdict reading is secretly scheduled for the weekend of the 14th-16th, more than likely on the 14th around 6pm after all the schools are cleared. This comes in part at the request of the schools. Our sources tell us that the verdict is 100% that they will not indict the Officer Darren Wilson. So there is no need to wait and find out what they say before making your travel plans if you are interested in protesting the verdict. The State has rolled in 9 heavy armored vehicles and which are currently being parked at Scott Air Force Base with 3 near the airport (the base is by the airport). Mconnel Air Force Base in Kansas is where the armored vehicles came from which is why one of our sources spotted the convoy of them near Salina, Kansas. Our sources also tell us that the National Guard is 100% ready and preparing for the weekend and is currently stationed at Scott Air Force Base. The military base named Fort Riley in Kansas is where National Guard along with other agencies have been training and going over actions designed for mass civil unrest in Ferguson and have actively training in two-week programs for the last month and a half. After completion of training they were sent to wait in Fort Leanordwood, Missouri, and now the Air Force base as well. We are also being told that plans for downtown St. Louis are underway as well. The police are fearing mass civil unrest to spread in to downtown and other cities. A Black Hawk helicopter is parked at Lambert Airport in St. Louis as well, which gives us some idea about how heavy-handed of a police and military response the State is planning. On top of all of this, it should be noted that Darren Wilson is in Atlanta, not in Ferguson or surrounding areas. As well, residents and travelers should be advised to expect multiple strategic police lines, and street closures in and around Ferguson with no travel allowed in. Now here’s where it gets really interesting… Northrup Gruman has been hired as the IT contractor for Scott Air Force Base. Contacts on the inside are telling us that Alert status has been in affect this week for Ferguson as they are finishing their training in Kansas. 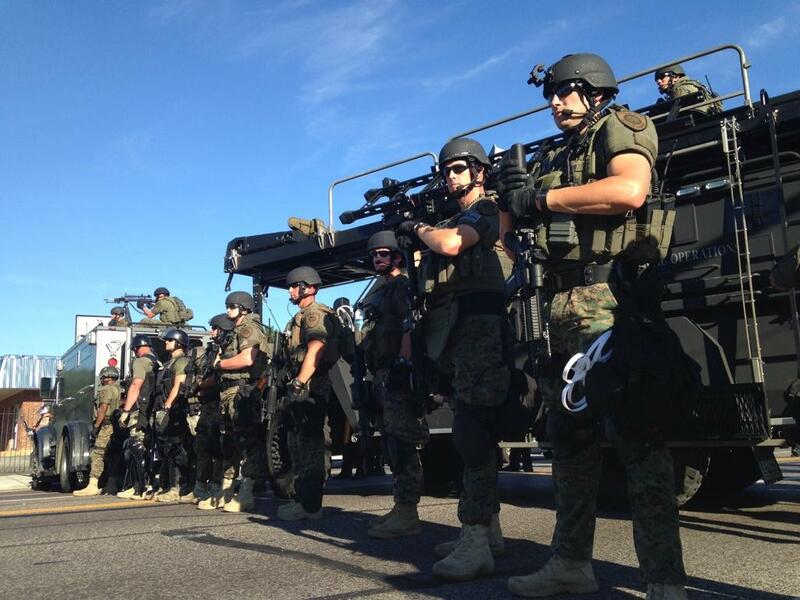 Cyber Security experts will be on the ground in Ferguson assisting police, who are taking orders from federal agencies. They will be involved in hacking or stopping electronic devices that the global hawk doesn’t affect (e.g. ham, frs). Prepare for this accordingly. They are trying to black out the police brutality that the State is preparing for against protesters. Please help us get the word out by spreading this FAR and WIDE!